I wanted to try making a mockup using C64 restrictions, which turned out to be a bit more of a challenge that I'd thought, and I didn't really have any ideas for it. The main character was just a doodle that evolved into this. I decided to draw a larger and more detailed drawing of it, which my boyfriend named Sally. Still C64 palette, but otherwise no restrictions. The Pixelation thread has more details about the initial steps. This is really good, the texture on the head and the ropes are impressive and a nice palette, a bit too psychodelic tough specially due to the blue on the back. DAMN. So freaking... juicy? Pretty much the only adjective I can describe this with. Looks like he's gonna pop. abso-smurfly great work! Love the palette. Awesome! It looks weird, but also inspirating. thats weird and interesting - well pixeled for sure. afterall ive never been a huge fan of the oh so well balanced c64 palette (even if i used to have 1 back in the day). so yeah nice geek-stuff in every sense. Thanks. Well, squatting is probably a better word. She's bipedal, so I think her knees would be pointing forward like in a human, but she has huge feet like a frog. Something like this, but I think she needs skinnier legs to match the arms. I haven't really thought much about how she's supposed to move with those legs in a dress. Hopping, maybe. I'll have to give animating her a go. I'm having a hard time imagining her sitting. Is she sitting on something, or on the ground? Are her knees forward like a human or to the side like a frog? Also, I didn't mention before, I love the mushrooms! They look great without standing out to much. Great job on those! Wow, thanks a lot, guys! Really glad to hear you like it. I didn't really decide to draw anything creepy. It almost seems to be my default mode of thinking. PaoloVictor - I don't think I got the shape of the sleeve quite right. It should be more apparent that it's narrower at the shoulder. It might be shaped like that because of the way I built up her shoulder or because the sleeves of this shirt is lopsided. tomic - I agree. I experimented a bit with blue on the mushrooms, but I was also using that for the leaves in the background and wanted them to be on a different level colorwise and not take too much attention away from Sal. I ended up brightening the light blue instead. I was also going for more contrast on the dress initially with the bright highlights, but that was before I had decided what type of fabric to go for. I considered using more black, but her arms are also black and easily obscured because of their size, so I wasn't sure how to pull that off. iLKke - I was going for a skeletal body, but she's pretty small and I found that cloth is surprisingly rigid. I imagined her to have froglike legs, so she's sitting, and I think her knees would prevent the cloth from sinking down too much. I used a lamp shade, a sock and some pencil cases to build up her body. I imagined her legs to be froglike, so she's sitting with her knees bent, but I couldn't really get them to protrude much with the conical form of the dress. The curved back is a great idea, though, and I'll see if I can find time to edit it in. Nice work, I like it how I could immediately tell from the thumb that it was you. From a creature-design standpoint, I like the bits protruding from the back, but I think they'd work better if the back were more curved. Wonderful Arachne! I loved seeing the progress of this at pixelation. I think you have an extremely unique character design here. Cute and slightly disturbing at the same time - I like! This is such a great picture of her too. So smooth, and lovely colours. The folds in the clothes are simply amazing too, and I like the goo dripping from the eyeball. nice atmosphere and very sweet look ... drops and small mushroom are my favourites, but drops look fantastic ! must-quote-dumbo :) great one saw the thread on pixelation. Man you have such a noticeable style..This is great. My only gripe is with his left sleeve, it has a strange "bell" shape. It looks great! The left sleeve bothers me a bit (I know that came up in your WIP thread, so I understand why you kept it that way). It just seems like there needs to be more separation between the chest and that sleeve. But other than that little thing, I love it. Your style is very nice. Great piece really!!! The strong glare on the head is the only thing that bothers me. Thanks! I ended up doing the shading on the back more like you suggested. 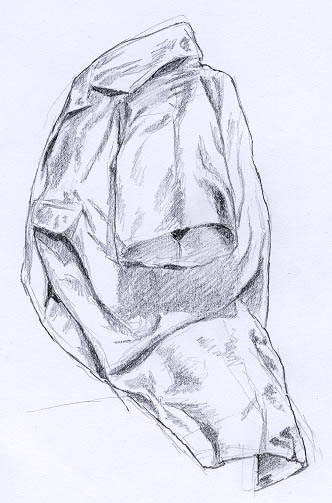 I should have kept in mind that I exaggerated the shading in my reference sketches since I was mostly interested in how the cloth folded at the time. So thanks for the help. It turned out really cool--great stuff!